In 1905 the Minefields were handed over to the Navy but the charge of the Defence Electric Lights and Communications remained with the R.E. and the branch was renamed the Electric Light Service. Only officers and men who had been trained in the special courses at the Submarine Mining Schools (later the Schools of Electric Lighting) were detailed for this special work. When The R.E. lost its responsibility for Submarine Mines in 1905, the Submarine Mining units were transferred to the R.E. Electrical units. Of the Submarine Mining Schools those at Portsmouth (Gosport) and Plymouth were better adpated for teaching defence electric lighting. The Submarine Mining Establishment at Stokes Bay became the R.E. School of Electric lighting. No.6 Electric Light Company was based at Stokes Bay, Gosport. 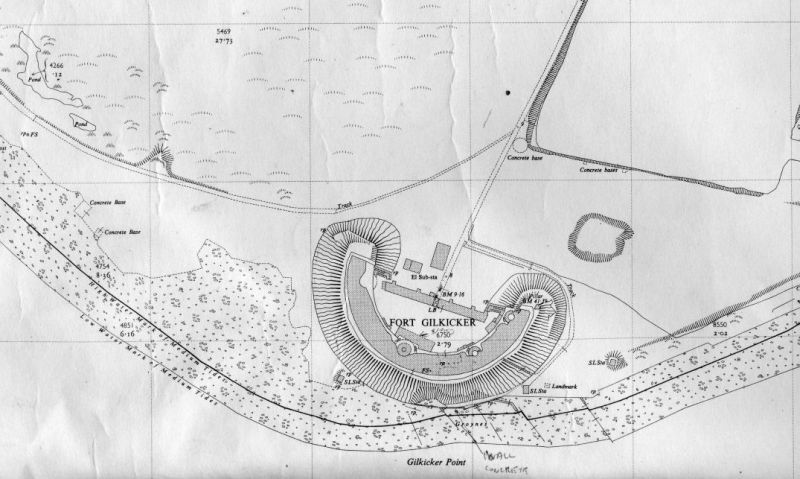 At Fort Gilkicker sometime after 1905 searchlights were installed, possibly for the purpose of practise and training due to Gilkicker's close proximity to the School of Electric Lighting (Searchlights). 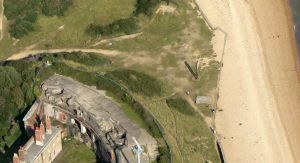 Two of the right (east casemates) were fitted with four crossley generators to power the searchlights which were installed in emplacements on concrete pads outside the fort, two to the east and two to the west. The wiring ran out of the gun port and down the earth bank. Sections of the armoured cables have been exposed due to recent earth slippage. The concrete bases for the searchlights can still be seen, one raised on an earth bank. 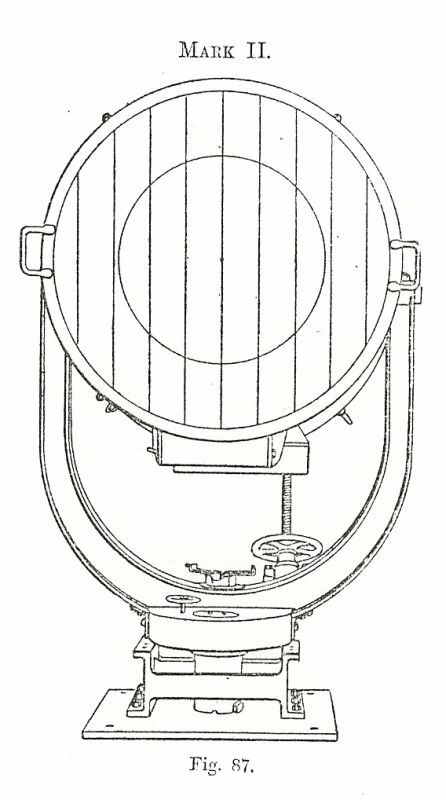 Four fixing points sugest that the searchlights were 90cm Mk III used from 1902 as defence electric lights. The old Fitters' shop to the rear of the fort was converted to an Electricity Sub Station. The exact date for the fitting of these searchlights is uncertain and nothing is shown on the various plans of Fort Gilkicker. 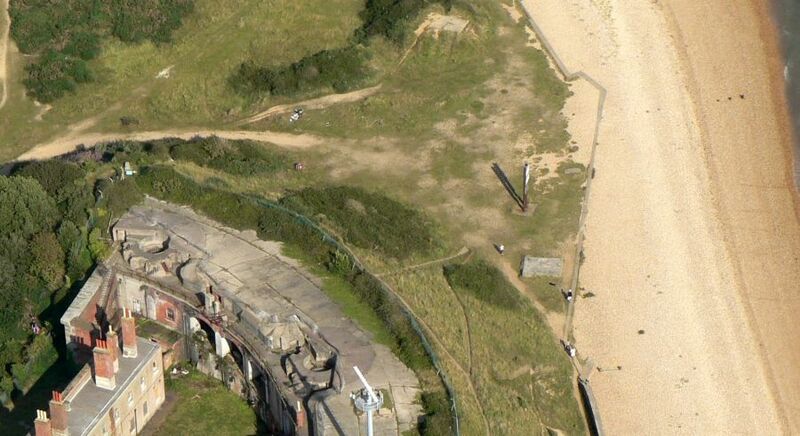 The searchlights were possibly removed sometime prior to World War Two, the bases are indicated on the OS maps of 1939 and 1950. A plan of the fort dated 1950 showing the concrete searchlight bases. In September, 1915, a valuable unit became available almost by chance to reinforce the A.A. defences of London. 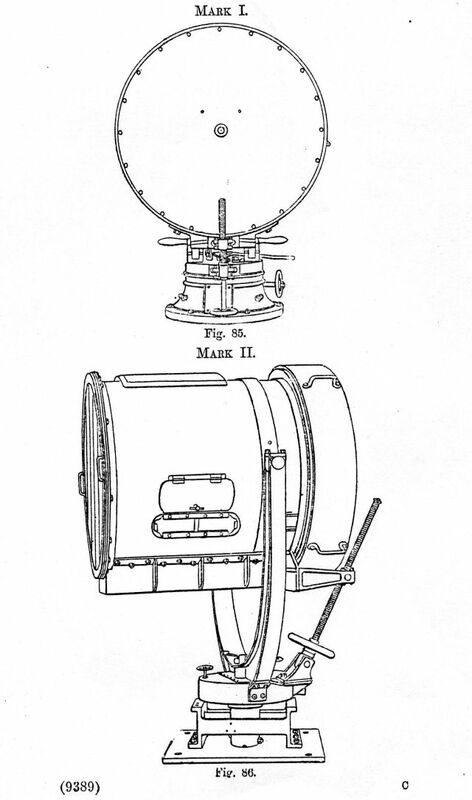 The regular 50th Field Searchlight (F.S.L.) Company, R.E., had been raised a few years before 1914 with a view to operating with the B.E.F. overseas. In 1913, however, its utility for that purpose was questioned and its personnel was transferred to other R.E. units, its equipment being returned to store. In August, 1915, it was decided to re-form this unit with personnel partly from the instructional staff of the School of Electric Lighting and partly from regular fortress units which had been relieved by Territorials. It was proposed to dispatch it to France. 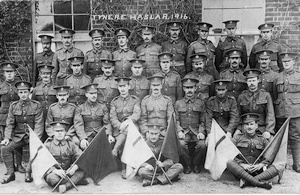 The Officer Commanding was Captain W. C. H. Prichard, R.E., an instructor at the School of E.L. While forming the unit, Prichard pondered over its probable employment in France. He doubted whether his lights would be mounted in the foremost trenches to light up no-man’s-land, and whether they would survive long if so employed. He conceived that it was more likely that he would be asked to light up attacking aeroplanes. His lights were not constructed for more than a moderate degree of elevation above the ground, although they had an all-round traverse, and he therefore improvised in his workshop at Gosport special U-shaped arms to hold his lights and allow the elevation required in A.A. defence. *Taken from The History of the Corps of Royal Engineers Vol. At Stokes Bay, Gosport, there was the School of Electric Lighting and Workshops, with an instructional staff of regular R.E. 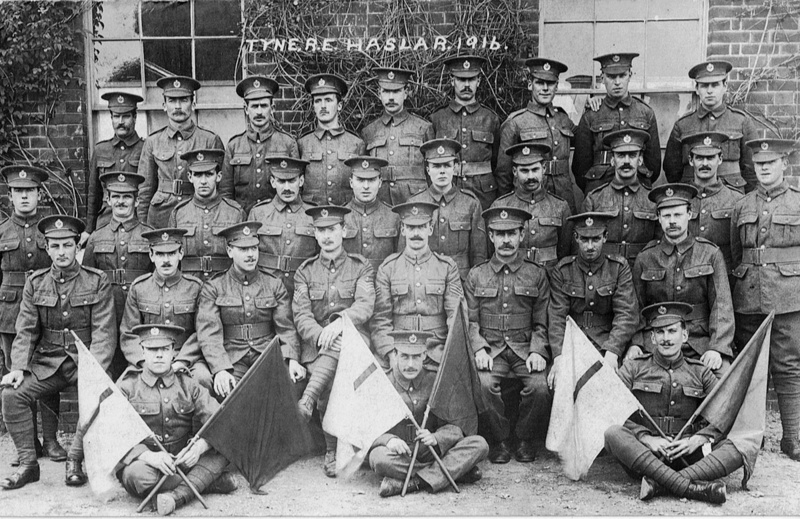 officers and other ranks, and upon them fell the burden of training the officers and men of all the searchlight units. In the summer of 1915 this school was taken over by the Tyne Electrical Engineers R.E. and was operated by them until the end of the war. Throughout 1916, and after A.A. searchlight units were formed, while others were reorganized or redistributed. Thus, in July of that year, the aeroplane squadron searchlight sections were reorganized as companies, and in December redesignated A.A. Companies, R.E. and increased in size to enable them to man not only the barrage lights but certain gun lights as well. By April, 1917, the T.E.E. had increased to 15 A.A.S. companies all with an expanded establishment, and the T.E.E. had twelve A.A.S. companies. In all, there was then a total of forty-two A.A.S companies, R.E. scattered about the country. 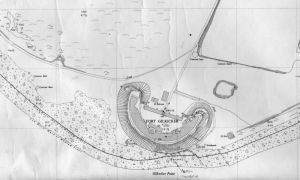 To cope with this great expansion the School of E.L. at Stokes Bay, Gosport, had to work at very high pressure to maintain a steady flow of trained officers and other ranks to draft to units. At the peak, instruction was given at the school during twenty-two hours of each day, including Sundays. Captain Monkhouse (T.E.E.) was Commandant of the School which was staffed by T.F. personnel selected from many units. In October, 1916, the schoo1 came under C.-in-C. Home Forces, and was re-christened the "A.A. Searchlight and Sound Location School." Later it moved to Ryde. The School of Electric Lighting (S.E.L.) at Stokes Bay, Gosport, then dealt mainly with technical and coast defence matters. 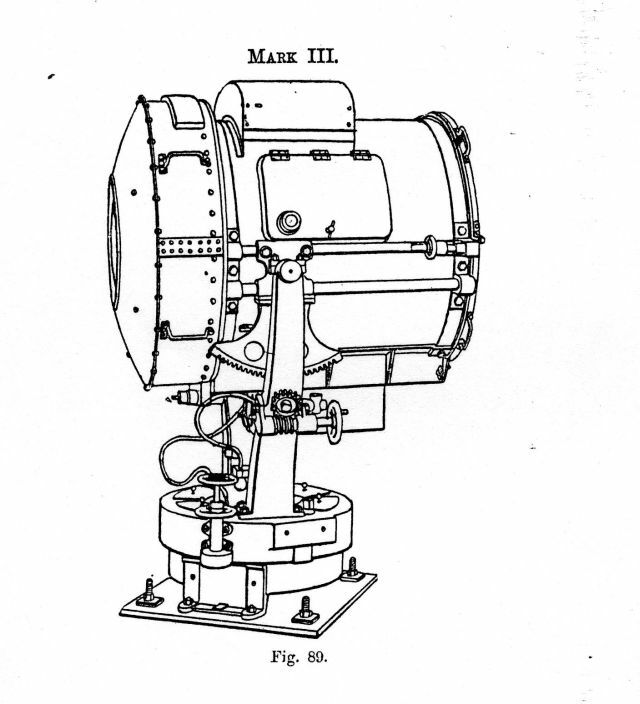 Searchlight Mark III - Projector, 90cm with glazed door and reflector frame. 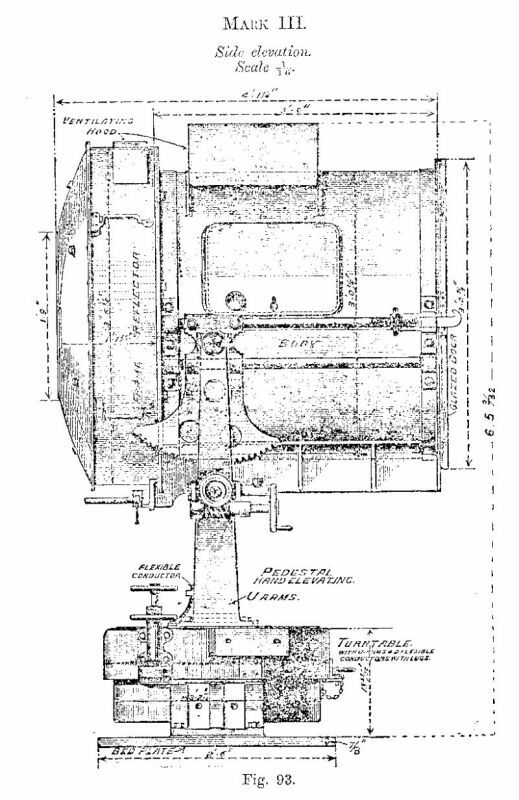 Service projector in use from 1902 for Defence Electric Lights.